There are many things in life I enjoy and one such thing is coffee. I like some of the "foo foo drinks" too (as I call them) on occasion once in a while like an Aztec Mocha from my local Insomnia Coffee Shop or a plain mocha or something like a blended drink or cappuccino. However, what I enjoy the most is plain black coffee as well as cold brew and then iced coffee with a little French vanilla creamer in it. These are my go to drinks that I enjoy...nothing too fancy but really good! Now that I think about it, I may have become a bit of a coffee snob a times because I really enjoy coffee and I'm, shall we say, selective with what I drink because by all means "friends don't let friends drink bad coffee". But I digress. Lol. With my passion for coffee, I have several mugs I enjoy and like the one featured in the picture above, (which I picked up on a family vacation) it's made for a purpose...and it sits ready in my office for a good ol' cup of Joe. While it can sit in a cupboard or sit on my office desk it's not really made to continually sit empty unless it's not going to be used. It's made to be filled with something either liquid goodness (coffee), tea or maybe to stuff pens and pencils in. I don't know but it's made, again, to be filled with something useful and good. Ok so you're probably thinking well...so what?! He likes coffee and this matters to me why? Well, I'm very glad you asked and hold on as there's something for you just around the rim of the coffee cup...or tea cup if that's your preference! I love serving God and others even more than coffee...true story! However, over the years I've gone through many seasons myself and witnessed others do the same, where they've/I've come to a place where I'm serving from a dry and basically empty place. On the outside like the mug, you can look useful and serve some purpose but if you keep trying to pour out from a dry place in your life you become ineffective really quick because you have nothing left to give from. Just like the mug is made for a purpose so are you and I. We're made to serve the purpose He has for our lives not from an empty place but a full place. The reality is that you can't serve God or others effectively if your cup (or mug) is empty so you have to keep filling yourself up with something that's not temporal. 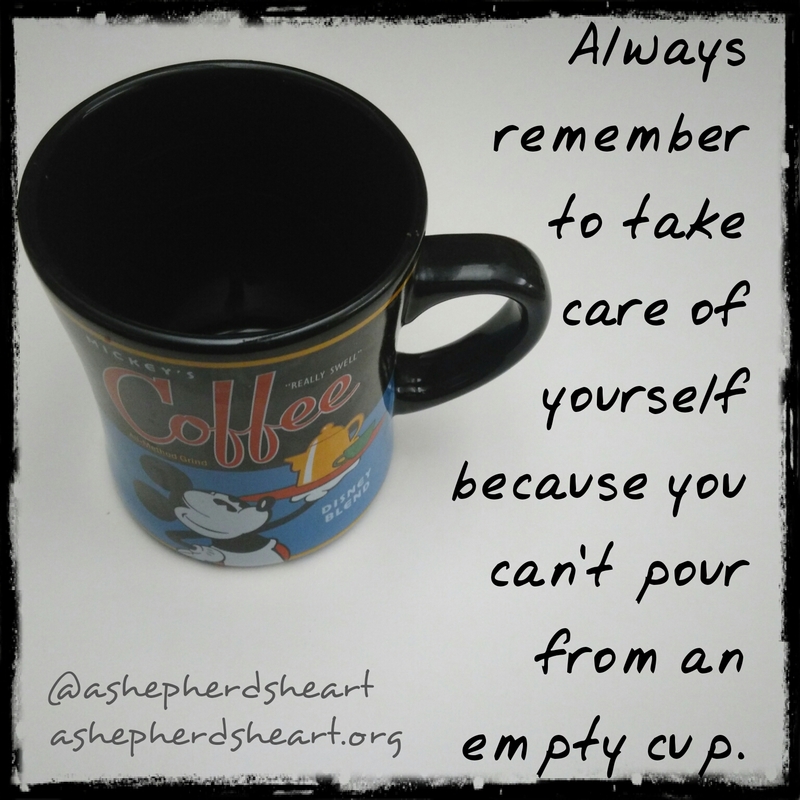 You have to take care of yourself and with this, you and I need to stop trying to pour out of and empty place! In order to care for yourself, you have to fill your heart, mind and soul with God's Word and a fresh filling of the Spirit of God each day so you can serve Him and His people from His abundance not from your emptiness. How do you stop pouring out of an empty cup? You also have to pray often so you are in communication with your Savior The Creator of heaven and earth, including creator of you! Speaking of being filled with The Spirit...did you know that this is vital to having a full cup? The Holy Spirit was given to believer's as #1 Jesus promised He'd send His helper to help us and I'm so thankful He did (See John 14:16 for example) and #2 as a verification of our future glorification in Christ. (2 Corinthians 1:22; Ephesians 4:30). Secondly, there is the Filling of The Spirit. This is continual after the indwelling and it's also a command as we see in Ephesians 5:18 to "be filled". This is not to say that we somehow lose the Spirit that indwells us but it does mean that we need to continual take obedient action so The Spirit fills and works in and through us. Filling comes through obedience to God as through our obedience the Holy Spirit has complete freedom to work in and through us. It's true and you can see it in your own life that the less obedient you are and the more resistant to Him you are...the less Spirit filled and led you are. Pray (Prayer is a vital tool) that you'll walk in obedience to Him more and more each day and seek to be fully grounded in God's Word (God's Word is the most vital tool) and live it out! So, allow the Holy Spirit to fill you, to fill your cup each day as you walk with Him and serve others pouring out and into them from a full cup instead of empty cup. If you'll do so, there will be more of you and more of Him to give out to others through you wherever you serve including your family and friends. This will allow you to serve from and out of His best and not your own leftovers that are dry and empty. Fill your cup from all that God has given you to fill it with so you can in turn fill the cups of others. Well said! God uses people to fill us up also!